"If you're looking for trouble - - - he's JOE KIDD". A band of Mexicans find their U. S. land claims denied and all the records destroyed in a courthouse fire. Their leader, Louis Chama, encourages them to use force to regain their land. 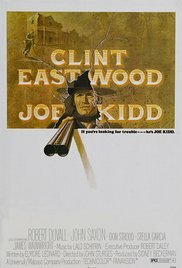 A wealthy landowner wanting the same decides to hire a gang of killers with Joe Kidd to track Chama.